It’s a pumpkin spice time of year and pumpkin spice everything is trending with no signal of stopping anytime soon, and why should it? Trends like pumpkin spice everything become more than a trend they become a tradition. Besides everything pumpkin spice, there are pumpkin seeds. In my own home growing up, we always had a pumpkin spice tradition and that was before it went viral. For me, fall came with the familiar aroma of freshly roasted pumpkin-spiced seeds and they were always the first signal of the holiday season. I can remember being half seated, half climbing across the counter reaching into the swampy mess of a freshly carved pumpkin. A stringy and moist room-temperature harvest of pumpkin seeds would yield to a pan soon piled with crispy and salty seeds of fall goodness. Oven roasted pumpkin seeds always smelled and tasted like being home during the holidays. I always knew that pumpkin spiced seeds meant handfuls of roasted, salty holiday flavor but I never knew they came along with an entire host of healthy nutrients. According to the USDA Super Tracker, 2 tablespoons of roasted pumpkin seeds pack 8 grams of protein, 4 grams of fibrous carbohydrates and 14 grams of healthy fats. Before you toss the seeds you should carve out some time to oven-roast these nutrient-packed morsels. Check out all the nutritional benefits packed inside of every pumpkin. They’re full of bone-strengthening magnesium: Every home needs a strong framework in order to stand and growing children are no different. Magnesium is a bone builder and adding some pumpkin seeds as a fun seasonal snack is a great way to keep their framework strong. Pumpkin seeds are a great source of zinc: Zinc is an essential mineral, which means that your body won’t naturally produce it. Instead, it’s essential that you acquire this immune-boosting mineral from foods and pumpkin seeds are a great option. Many immune-bolstering supplements start with zinc and it’s because of its reputation for fighting off that runny nose during cold and flu season. They contain healthy fats that can keep you alive: Pumpkin seeds pack a powerful combination of linoleic acids and omega-6 fatty acids, both of which have been shown to improve heart health. Some extra pumpkin seeds can set your children up for a long and heart-healthy life. So, carve that pumpkin and carve out some time to oven roast your own pumpkin spiced seeds for a nutrient-packed snack. 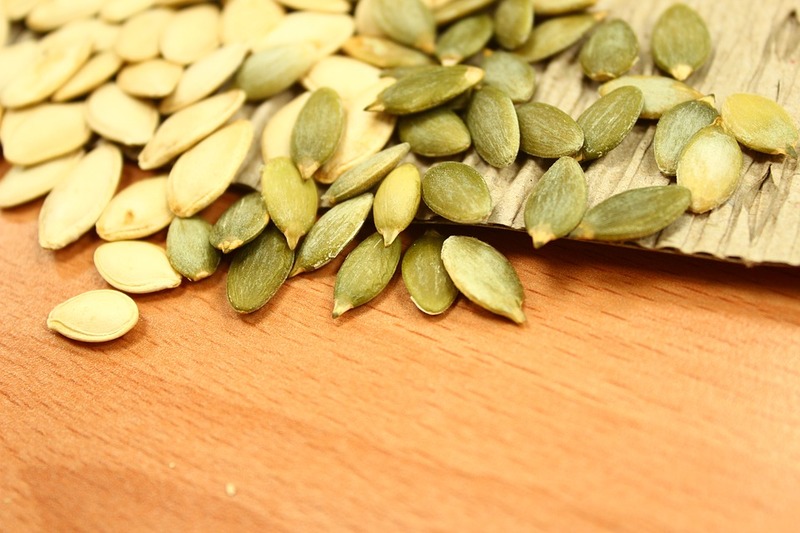 Here are a few easy steps you can follow to roast your own pumpkin seeds at home. Go to Fill Your Plate for holiday recipes. Arizona Farm Bureau created Fill Your Plate, an online, searchable database of Arizona farmers and ranchers that can sell food products and certainly local Arizona food directly to you and me. That might even include pumpkin seeds. This entry was posted in Arizona, Cooking, Fall, Food, Food Facts, Health Tips, Healthy Eating, In Season and tagged Autumn, Fall, Health, Healthy, Nutrition, Pumpkin, seeds. Bookmark the permalink.